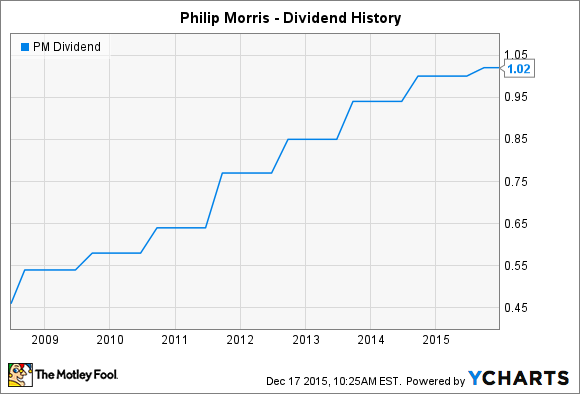 Will Philip Morris International Inc. Raise Its Dividend in 2016? Can the tobacco giant keep up its streak of dividend performance? In its brief history as an independent company, Philip Morris International (NYSE:PM) has done a good job of following in the footsteps of its U.S. counterpart and former parent company. Shareholders have gotten eight increases in the tobacco company's dividend since 2008, and Philip Morris has done a good job of sustaining its growth against rivals British American Tobacco (NYSE:BTI) and Imperial Tobacco (NASDAQOTH:IMBBY) even as the regulatory environment in several nations around the world has become less favorable. More recently, though, Philip Morris has slowed its dividend growth, and that has some investors concerned about its future. Let's look more closely at Philip Morris to see whether investors should expect a dividend hike for the international tobacco giant in 2016. Philip Morris International quickly developed a good reputation for rewarding its shareholders with higher dividend payouts. Shortly after it went public in 2008, Philip Morris raised its dividend 17%, and even in the aftermath of the financial crisis, the company managed an increase. From 2010 to 2013, the cigarette maker gave investors double-digit percentage dividend growth, with a double-sized 20% boost in 2011 thrown in for good measure. More recently, the face of Philip Morris International's dividend growth has slowed. A 6% rise in 2014 raised some alarm bells, and this year's 2% boost seemed almost like a token gesture. The primary problem that has held back Philip Morris has been the strength of the U.S. dollar. As a U.S. company that does all of its business overseas, Philip Morris relies on revenue denominated in foreign currencies, and those currencies have generally performed badly for several years. As the U.S. economy continues to outperform much of the rest of the world, the dollar's strength has had an even greater influence on internationally focused companies, and Philip Morris is one of the most extreme examples. For instance, in Philip Morris' most recent quarter, the company posted adjusted earnings of $1.24 per share. Yet the impact of falling foreign currencies cost Philip Morris $0.37 per share in earnings. The effect on the top line has been equally large, with a $1.4 billion currency hit to sales turning what would have been 6% revenue growth into a 12% drop. Those are problems that British American Tobacco and Imperial Tobacco largely don't have to deal with, as the British pound has weakened appreciably against the U.S. dollar over the past year, putting Imperial and British American in a better foreign-exchange position. Nevertheless, Philip Morris has made it clear that its priority is to sustain and grow the dividend. The company has suspended what was a large stock repurchase program for 2015 in order to ensure that sufficient capital was available to continue making dividend payments. To do so, Philip Morris has made smart business moves. The company's investment in cigarette alternatives has risen lately, with its iQOS heat-not-burn technology showing early signs of promise among customers. The tobacco giant has also used strategies to reduce internal costs while keeping cigarette prices moving higher to help offset the dollar's impact. When will Philip Morris International's dividends rise again? Philip Morris' 2% increase came just a few months ago, and the company generally announces dividend boosts around the same time each year in early to mid-September. With the company's payout ratio being fairly high, the future of Philip Morris International's dividend growth will rely largely on what happens to foreign currency exchange rates between now and next summer. If the dollar can finally stop appreciating quite so much against key currencies, then Philip Morris could finally get back to a position in which double-digit percentage dividend growth is a possibility for 2016 and beyond.